The first lighthouse was wooden structure, the first lighthouse on SW coast of Nova Scotia. In 1818 it was described as "so vilely constructed and ill lighted" it was a hazard. By 1832 it had been rebuilt, due inefficiency. This light was an octagonal wood tower with a metal lantern. The building was painted white, with 3 red bands. A large fog signal building also stood on the site. This tower burned in 1944 and was replaced by the current concrete tower. 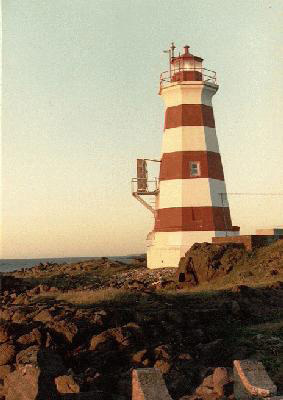 Photo - © Kathy Brown, Brier Island Lighthouse at Sunset c. 1994, Note the electronic fog horn apparatus on the left side of the lighthouse. The lighthouse is located on the southwest side of Brier Island just north of Whipple Point. Whipple Point is the SE extreme of Brier Island. From the there, Gull Rocks Bars, most of which dry, extend 1.5 miles SW to Gull Rock, 2 m (7 ft) high. Brier Island Southwest Ledge, at a least depth of 4.1 m (13 ft), is situated 1.9 miles SW of Gull Ledge. A heavy tide rip extends from Gull Rock to about 1.5 miles SSW of the ledge. The lighthouse stands on guard against this hazard. 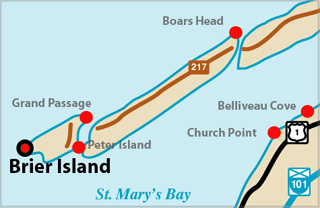 It is accessible by a road across the island. Light Height: 092ft feet above water level. Light Height: 095ft feet above water level.